Jim Hansen’s comprehensive computer models indisputably revealed that Cycle 24 would start up in March; then May. As of June 25, no Cycle 24. 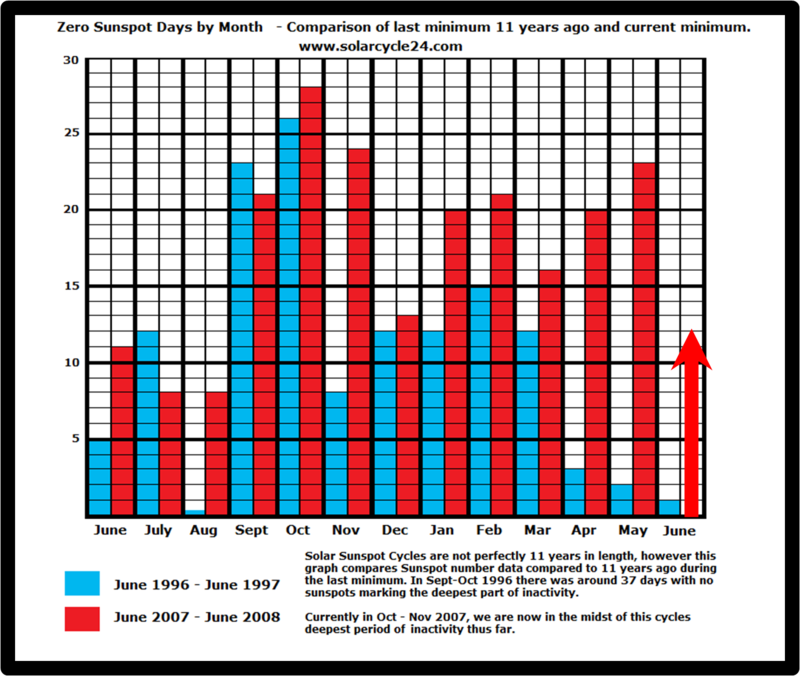 Jim Hansen does not have a clue about when Cycle 24 will start, because he has been utterly absorbed in extorting carbon ransom from successful (capitalist) economies. Other responsible scientists, by the thousands have deplored the distortion, lies, and pathetically bad science. Still, your tax dollars exclusively feed global warming hysteria, Al Gore and Jim Hansen’s personal gold mine. Relevant to food, our supply of the same is utterly dependent on the generous growing seasons of the recent warm period. We have no margin in food productivity for icy exigency, as this latest spring growing season demonstrated. Which Solar cycle is it, that will mark another Solar shut-down as occurred in 1650, and numerous, perhaps uncountable, occasions before? Is it Cycle 24? Sunspot-free days are only one of many poorly understood and criminally under-researched characteristics of our only source of warmth, the Sun. The Solar shut-down of 1650, called the Maunder Minimum, drastically abbreviated crop growing seasons and resulted in large-scale human suffering and death. A New Ice Age is absolutely on its way, as Al Gore, Jim Hansen, and affiliated parasites line their pockets and divert scientific effort from its legitimate purpose; the grain riots have already started. Could it be the reluctant Cycle 24? If our only source of warmth is the sun… then… could it be… the sun causes global warming? I think the earth will continue to cool and warm as it always has done, but I don’t think we can survive Hansen’s and Gore’s plans. Take a look at today’s Independent. I have a link on my site. The next ice age is clearly on it’s way. The Cause? The Earth is going to be pushed away from the Sun, just as it was pushed towards the Sun 18,500 years ago. The data are right in the latest NASA program which calculates planetary perturbations. Positions in the Solar system are opposite of what they were back 18,500 years ago. Just take a look at the graphs of last 400,000 years of Ice ages. The so called global warming should fade away starting lat 2012. The teperature drop may be in the area of 6 degrees Celcius. Thomas next time u post a theory that isnt yours ask the person?? Thomas is not even original in his B.S.